AMMAN, Aug 31 2014 (IPS) - As the region is rocked by violence against a backdrop of the rise of radical groups, Jordan’s lesbian gay bisexual and transgender (LGBT) community fears that new instability in the Hashemite kingdom could lead to increased intolerance towards the community. The Jabal Amman historical district, crisscrossed by quaint streets, cafés and art galleries has become a hub for the Jordanian capital’s LGBT community. 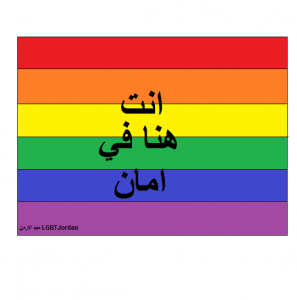 “Jordan does not have any laws against homosexuality; it does not, however, protect civil liberties for people facing discrimination on basis of their sexual preferences,” says Madian, a local activist. Despite the absence of any article in Jordanian law that explicitly outlaws homosexual acts, there have been several crackdowns on members of the gay community. “The targeting of the LGBT community is not something that is systematic, but it still happens from time to time,” says George Azzi, head of the Arab Foundation for Freedoms and Equality. In October 2008, security forces in Amman “launched a campaign that targets ‘homosexuals’,” after security forces verified that they were gathering and meeting up at a park near a private hospital in Amman, according to a study on Law and Homosexuality: Survey and Analysis of Legislation Across the Arab World by Walid Ferchichit. In the last few years, a few arrests have been made on the margin of private parties. Most of the arrests were made under the vaguely worded indecency law and the need to “respect the values of the Arab and Islamic nation”, although the arrests were rarely followed by formal charges. The Hashemite Kingdom is an Islamic country, where homosexuality is considered as a sin. “Some members of the LGBT community have even been arrested for satanic worshipping,” notes Madian. The basic form of social organisation in Jordan is heavily influenced by tribalism, which weighs on social norms and relations between people. “Members of the LGBT community fall prey to discrimination or violence not necessarily at the hand of the state but of society or their families,” says Azzi. He recalls two members of the gay community who had to be smuggled out of Jordan to escape the wrath of their families who discovered their sexual preferences, and possible death. “I know of four people at least who were killed in last few years for this reason,” says Madian. He also says that while some victims have been the target of honour killings, others have been killed by gangs because they had to seek impoverished and dangerous areas for sexual favours to avoid the scrutiny of friends and families. Nevertheless, despite such individual cases, the topic of homosexuality seems to be increasingly tolerated in Jordan. In 2012, a book called “Arous Amman” (Amman’s fiancée) by Fadi Zaghmout was published, featuring a homosexual character who was driven to marry a woman despite being gay. Increasingly, Facebook pages and Twitter accounts are advocating gay rights and the LGBT community in the country. “The LGBT community has been able to carve a space for itself in society, while staying away from anything that could raise its profile,” says Adam Coogle, a researcher at Human Rights Watch. But, with social and cultural mores considering homosexuality a sin and unnatural, advocating rights remains a taboo in the Hashemite Kingdom, and LGBT activism a somewhat difficult task. “We tried organising a few years back by creating an NGO but our application was rejected by the Ministry of Social Affairs on the basis of the indecency law,” says Madian. Gay activism has also become more challenging today due to the security situation prevailing in the region, worrying both activists and human rights organizations. With Jordan home to thousands of Salafi Jihadists, it is directly concerned by possible rising numbers of home-grown members of the Islamic State. Members of the gay community fear that renewed insecurity could jeopardise their space in society. “Nonetheless, members of the LGBT community are not alone in being concerned about Jihadist threats which also target secular people as well as religious minorities,” adds Coogle.